Simply put, over-stabilization occurs when too much cyanuric acid is added to pool water. 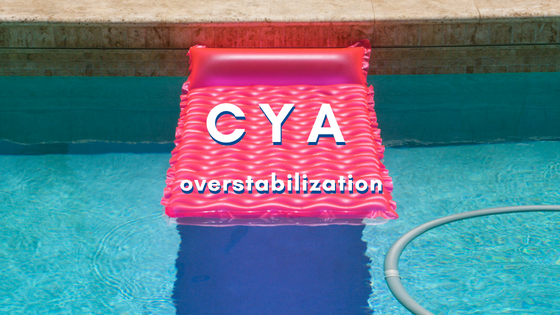 Over-stabilization is a problem because cyanuric acid (CYA) can slow down chlorine’s ability to kill pathogens and algae. To explain this, you need to know that hypochlorous acid (HOCl) is the active form of chlorine in pools. The concentration of HOCl is affected by both the pH and the CYA concentration. Figure 1 shows the well-known relationship between pH and HOCl. Even with very low (<10 ppm) concentrations of CYA, the concentration of active chlorine (HOCl) is decreased significantly. From these plots, it is clear that we need to control both pH and CYA concentrations to maintain an effective HOCl concentration. 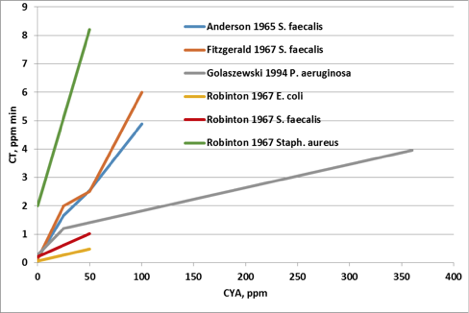 Figure 3 shows that the reduction in HOCl concentration has a very real effect on the disinfection rate of bacteria3,4,5,6. 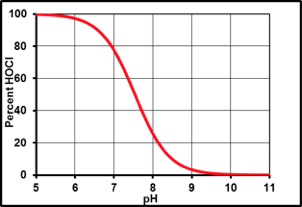 Disinfection rates are typically measured in terms of CT values, where C is the concentration of disinfectant and T is the time needed to inactivate the organism. 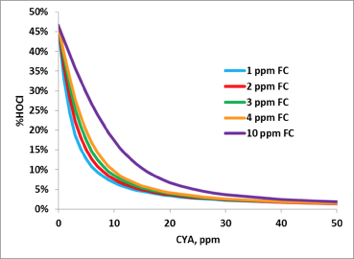 The data in Figure 3 show that with increasing CYA concentrations, the CT value increases.  With more CYA, it takes more time and more disinfectant to kill the bacteria. In a 2004 study performed by Lonza, eight identical 6,800-gallon pools were operated for three months at a test facility in Miami FL: two control pools with no CYA, two pools at 25-50 ppm CYA, two pools at 100-125 ppm CYA, and two pools at 200-250 ppm CYA. Algae and synthetic bather load were added to the pools once a week. Each week, 2 days after the contaminant additions, the pools were shocked with 10 ppm available chlorine using calcium hypochlorite (cal hypo). The following chart shows that increasing CYA concentrations led to increased algae counts. The pools with 25-50 CYA had almost twice as many algae as the pools without CYA, and the 100-125 ppm CYA pools had between 9 and 10 times the algae! Despite its drawbacks, CYA is a useful tool because it stabilizes chlorine so that it is not degraded by sunlight. So the questions are, how do you maintain a chlorine residual without compromising its efficacy? The answer is to use as little CYA as necessary to maintain a chlorine residual and have a way to slowly and constantly add unstabilized chlorine to the water. Commercial pools have been doing this for years. By adding a small amount of CYA to the pool, the chlorine residual is stabilized. Then, unstabilized products such as chlorine gas, sodium hypochlorite (liquid bleach), or cal hypo are used to provide a steady source of chlorine. In commercial pools, the chlorine feed is usually performed using feeding equipment and controllers. In residential settings, trichloroisocyanuric acid (trichlor), a slow dissolving stabilized chlorinator, has been used in floaters, feeders, and skimmers to provide a steady source of chlorine to pool water. The advantage of trichlor is that it is slow dissolving, so daily additions of chemicals are not needed, and the equipment needed to feed trichlor to the water (i.e. a floater or tablet feeder) is very simple and inexpensive. However, for every pound of trichlor added, about half a pound of cyanuric acid is added to the pool. With the use of trichlor, cyanuric acid concentrations can quickly build up and chlorine efficacy can be compromised. The unstabilized sanitizers, cal hypo, and liquid bleach work great as sanitizers. But because they are fast dissolving, the equipment needed to feed these products has been more complex and expensive. That is why many residential pool owners have used trichlor as their primary sanitizer and cal hypo as a weekly shock treatment. Until now. There are now slow-dissolve cal hypo tablets on the market. They are available for commercial and residential use. The commercial brands are Pulsar Infinity and CCH Endurance. The residential brands are available through professional dealers (Poolife NST) and mass merchants (HTH Blue Sparkle Skimmer Tabs). Each of these formulations is unique and tailored to the needs of each market, but they are all slow dissolving like a trichlor tablet. Although these tablets dissolve very similar to trichlor tablets, they cannot be used in trichlor feeders. Trichlor and cal hypo are incompatible and combining them can be extremely dangerous. Putting both of these tablets into a feeder could cause a fire, explosion and the release of toxic gases and result in property damage, injuries or even death. For commercial pools, both Pulsar and CCH have feeders designed for use with the slow dissolve cal hypo tablets. For residential pools, the tablets should only be used in the skimmer to avoid potential contact with incompatible trichlor tablets. 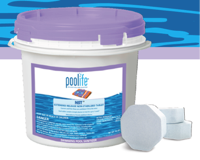 Many pool professionals are wary of putting chlorine tablets in the skimmer. With trichlor, these worries are well-founded. The combination of low pH and high chlorine of trichlor tablets can wreak havoc on pumps and other pool equipment. Cal-hypo, on the other hand, has a high pH. Therefore when it is used, the water moving through the equipment will have high chlorine content, but the chlorine is not as active due to the high pH. The table shows that the amount of draining required to maintain the correct Ca level with NST will be less than the amount of draining needed to maintain the correct CYA level. In addition to this advantage, cal hypo helps to protect pool plaster due to its calcium content and high pH. If you are maintaining your chlorine residual with trichlor or shocking with dichlor, not only are you adding chlorine to the pool, but you are also adding CYA. CYA hinders chlorine efficacy and should be maintained at the lowest concentration needed to maintain a chlorine residual. Slow dissolve cal hypo tablets are now available that offer the convenience of trichlor, without the CYA. These tablets and the proprietary, slow dissolving technology in them are long lasting and leave no trace of CYA. This non-stabilized chemistry helps to avoid overstabilization by giving the pool owner the choices of how much CYA to add and when. With slow dissolving cal hypo tablets, it is no longer necessary to choose between convenience and efficacy. ABOUT THE AUTHOR: Dr. Ellen Meyer is technical service manager with Lonza, a global supplier of pool and spa/hot tub chemicals. She has chaired the recreational water quality committee of Association of Pool & Spa Professionals (APSP), and currently serves on the technical review committee of the Model Aquatic Health Code (MAHC), and is a member of the NSF International task group for pool chemical evaluation. 1 HOCl dissociation constant from Handbook of Chlorination, Second Edition, G. C. White, Van Nostrand Reinhold Company, New York, 1986. 2 O’Brien, J. E., Hydrolytic and ionization equilibria of chlorinated isocyanurate in water, Ph.D. Thesis, Harvard University, May 1972. 3 Anderson JR. A study of the influence of cyanuric acid on the bactericidal effectiveness of chlorine. Am J Public Health Nations Health. 1965 Oct;55(10):1629-37. 4 Fitzgerald GP, DerVartanian ME. Factors influencing the effectiveness of swimming pool bactericides. Appl Microbiol. 1967 May;15(3):504-9. 5 Golaszewski G et al. The kinetics of the action of chloroisocyanurates on three bacteria: Pseudomonas aeruginosa, Streptococcus faecalis, and Staphylococcus aureus. Water Research 1994;28(1): 207-217. 6 Robinton ED et al. An evaluation of the inhibitory influence of cyanuric acid upon swimming pool disinfection. Am J Public Health. 1967 Feb;57(2):301-10.